No matter what challenge your application presents you with: With the various attachments, you always have the situation under control. 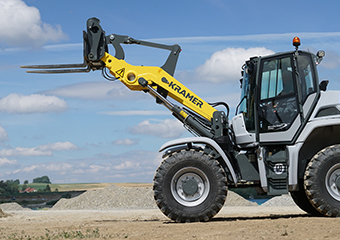 Thanks to the hydraulic quick-hitch system, you can adapt your Kramer machines to any situation in no time at all. Standard attachments can even be changed in less than 10 seconds. 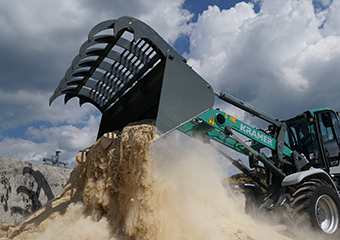 Kramer buckets are designed to fit perfectly to the vehicle and the different tasks, resulting in a perfect interaction between the carrier machine and the bucket. The original Kramer buckets stand out due to their high stability. The large back tilt angle allows the bucket to be filled to an impressive level, increasing efficiency and productivity. The Kramer stacking device makes it easy to lift and stack different materials on top of each other. 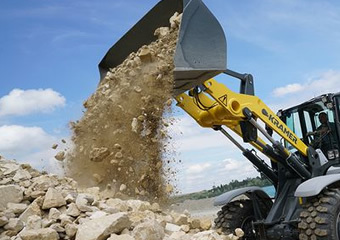 It is therefore worth having the right Kramer attachments ready for different tasks, because loading and stacking work can only be carried out safely and quickly with the right attachments. Kramer also offers the right agricultural attachments for the wide range of work required on the farm, in the barn or, for example, in the biogas plant. The Kramer manure fork, multi-purpose fork or combination grab are available for manure removal. Round or rectangular bales are best transported with a Kramer bale skewer or bale tongs, and the silage bite bucket combines the best of bucket and tongs. Thanks to the working platform, sweeper or winter service attachments such as the salt spreader or snow plough, Kramer machines are ideal for use in towns and municipalities. The wide range of optional attachments means that the vehicles are fully utilised all year round. Not the right attachment tool? Please contact us!